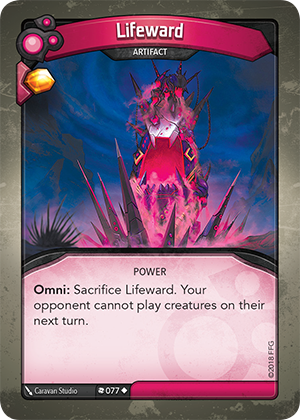 Card Text Omni: Sacrifice Lifeward. Your opponent cannot play creatures on their next turn. What happens if I used Lifeward’s “Omni:” ability and on my opponent next turn they play a creature via Wild Wormhole (“Play the top card of your deck”)? The creature cannot be played due to Lifeward, so it returns to the top of your opponent’s deck.